Lots of ruffles make dressing up fun. 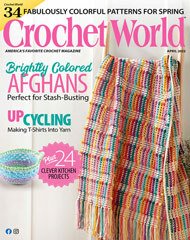 This e-pattern was originally published in the August 2009 issue of Crochet World magazine. Size: Includes girl's 2 through 10. Made with medium (worsted) weight yarn and size H (5mm) hook.